The black bullmastiff is a large, dark-brindled breed, originally trained to be a follower with deep loyalty to their pack leader. English gamekeepers called them the “Gamekeeper’s Night Dog” and the characteristics of that role continue to this day, as they are strong, agile, and capable home protectors. 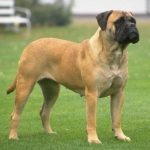 According to the AKC Breed Standards, the bullmastiff will have a symmetrically shaped body, with a lot of power and alertness built into its stance. It is a large breed. Males stand 25-27 inches and can weigh between 110-130 pounds (50-69kg) whereas females stand 24-25 inches tall and weight slightly less, 100-120 pounds. It comes in six colors, including black. The bullmastiff should have a nearly square body, with dark, medium shaped eyes and triangular ears. 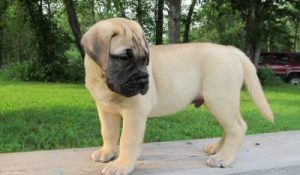 The bullmastiff was bred by English gamekeepers with a mixture of 60 percent mastiff and 40 percent extinct English bulldog. The gamekeepers kept the dogs to help track and prevent poachers by finding and threatening them, but were taught not to bite the ones they captured. The black color was highly prized early in the bullmastiff history, as the darker color was ideal for night camouflage and wooded environments. The earliest mentions of the breed date back to 1724, and they were officially recognized by the English Kennel Club in 1924. The American Kennel Club followed, recognizing the breed in 1933. Over the last century, the dog has been bred more as a home companion and protector than to track poachers through dark forests, and so the black coloring has become less common compared to brindle, fawn, and red. It is currently ranked as the 48th most popular dog breed in the United States. The black bullmastiff is a large breed that requires plenty of exercise. They may be happy snoozing with you on the couch, but only after a thrilling romp on the leash outdoors. Owners should make sure they have both plenty of space and time to give this breed the exercise that it needs every day. However, with their short snout, dark coloring and stocky body, black bullmastiffs do not do well in hot and humid climates. Grooming is relatively easy. Their short coat should be combed and brushed regularly with a short bristled brush and only shampooed when necessary. They shed very little. Owners should pay close attention to their feet and keep their claws trimmed and neat. 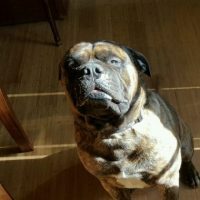 Many bullmastiffs drool. Owners should be prepared for this, and give the dog large, comfortable beds to sleep on which can be washed or shampooed easily. 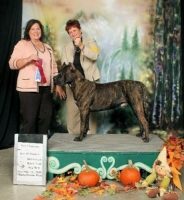 The black bullmastiff is a breed best suited to an experienced and capable dog owner. When well-trained and socialized, they are an intelligent, friendly animal, but fiercely loyal to their owners and often standoffish with strangers. 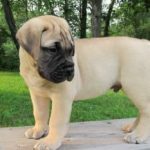 Training should begin as early as possible, because the young bullmastiff puppy will grow quickly into a large and powerful dog. Their demeanor is said to be steady and reliable, and when raised around children they can be gentle and protective at the same time. 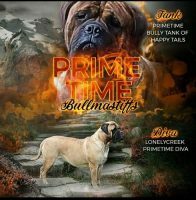 Some bullmastiffs can have difficulties with other dogs, especially males, so early socialization and firm training is a must. Yet while trainers should be firm, the dogs respond best to positive reinforcement and a loving home, as their loyalty is hard-won and strong. Like many large breeds, the bullmastiff is prone to many health problems and has a lifespan averaging 8-10 years. In particular, the breed is prone to cancers, bloat, hypothyroidism, and sub-aortic stenosis (SAS) and hip and elbow ailments owing to their bulky bodies. Veterinary care will be crucial throughout their lives to detect and provide early treatment for many of those conditions. Proper exercise and a balanced diet will also help the bullmastiff live a long and healthy life. Many veterinarians recommend that the dogs eat two or three smaller meals per day instead of one large meal, as this will keep them from overeating, and keep their digestion balanced. They can easily gain weight, which is a major risk factor for bloat and hip dysplasia.